Beautify your property while controlling stormwater runoff. A rain garden is a landscaped area planted to wild flowers and other native vegetation that soaks up rain water, mainly from the roof of a house or other building. The rain garden fills with a few inches of water after a storm and the water slowly filters into the ground rather than running off to a storm drain. Compared to a conventional patch of lawn, a rain garden allows more water to soak into the ground. Why build a rain garden at your home? As cities and suburbs grow and replace forests and agricultural land, increased stormwater runoff from impervious surfaces becomes a problem. Stormwater runoff from developed areas increases flooding, carries pollutants from streets, parking lots and even lawns into local streams and lakes, and leads to costly municipal improvements in stormwater treatment structures. By building a rain garden at your home, you can play a valuable role in changing these trends. The following are some Frequently Asked Questions by homeowners. Q. Does a rain garden form a pond? A. No. The rain water will soak in so the rain garden is dry between rainfalls. Q. Is it a breeding ground for mosquitoes? A. No. Mosquitoes need 7 to 12 days to lay and hatch eggs, and standing water in the rain garden will last for a few hours after most storms. Mosquitoes are more likely to lay eggs in bird baths, storm sewers, and lawns than in a sunny rain garden. Also rain gardens attract dragon flies, which eat mosquitoes. Q. Do they require a lot of maintenance? A. 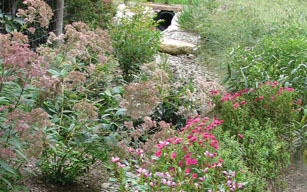 Rain gardens can be maintained with little effort after the plants are established. Some weeding and watering will be needed in the first two years, and perhaps some thinning in later years as the plants mature. Q. Is a rain garden expensive? A. It doesn’t have to be. A family and a few friends can provide the labor. The main cost will be purchasing the plants, and even this cost can be minimized by using some native plants that might already exist in the yard or in a neighbor’s yard. Q. Who should build a rain garden? A. You! Homeowners can create a rain garden with a little assistance.